Save recipient address' and set up event reminders. Be the first to get updates on our exclusive discounts and offers. Because You Just Can’t Afford To Be Late! Gifting flowers in Canada is a great tradition for different occasions like Birthdays, Anniversaries, Sympathy, Funerals etc. If you are visiting someone’s house in Canada, make sure to carry gourmet chocolates, flowers or a bottle of wine for the host/hostess. Red roses, orchids, stargazers are popular gifting flowers in this country. Send flowers same day to Canada using our local florists & flower shops. Order by 12 noon. Send Mother's Day Pink Roses, Lilies, Carnations & Special Gifts to Canada. Send Roses, Carnations, Lilies throughout Canada for occasions like Birthdays, Anniversaries, Funerals, etc. Enjoy affordable flower delivery across Toronto, Montreal, Vancouver, Calgary & nationwide delivery. Thanks a lot Richard. I have recommended all my Relatives & Friends to use your Super Services with the Beautiful Floral Arrangements. Your prices are Great, plus you ship around the world. I was really happy to have found you. So, I have told not only people from the USA, but also China, Europe & Australia about FLORA2000.com, EXCELLENT COMPANY!!! It looks like love! 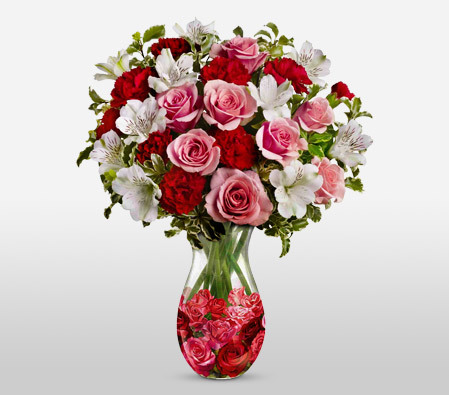 A bouquet of light pink and red blooms is the perfect choice for a lovely glass vase adorned with a sweet rose pattern. Send Valentine Flowers to Canada now. The world's most sought after luxury floral ensembles are now available in a vase near you at surprisingly affordable prices and with an extended array of Gifts! Featuring international brands, sleek designs, clean cuts, and elegant accessories - our chic international ensembles have been thoughtfully crafted to suit urban sensibilities. Gift in style and choose from our vast collection of Flowers, Hampers, Soft Toys, Perfumes etc. How do i send International Flower Delivery to Canada? Flora2000 has transformed International flower delivery to Canada into a fine and effortless art. With our efficient flowers & gifs delivery services worldwide; you are sure to find the perfect expression of your message to your loved ones. Be it Roses, Lilies, Carnations or Cakes, our gifts are sure to make both the sender and the receiver happy. We make sure the gifts you give reflects what you feel about the receiver. It is the second largest country in the world, also known for its outstanding scenery and unique culture. Gifting flowers in Canada is a great tradition for different occasions like Birthdays, Anniversaries, Sympathy, Funerals etc. In cities like Manitoba, Quebec, Alberta, Saskatchewan, Yukon etc; Consumers are increasingly opting to purchase flowers from e-commerce operators and supermarkets, due to their added convenience and lower prices. If you are visiting someone’s house in Canada, make sure to carry gourmet chocolates, flowers or a bottle of wine for the host/hostess. Red roses, orchids, stargazers are popular gifting flowers in this country. Canada is the second largest country in the world which is known for its breathtaking landscapes and different culture. White lilies and chrysanthemums’ are flowers used during funerals while red roses are considered apt choices for love and romance. Avoid giving cash or money as a gift. Whenever you are having a conversation with Canadian avoids topics which compare Canada with US or other countries. Mother's Day is celebrated on 2nd Sunday in the month of May. Children of all ages pamper their mothers with something special be it Mother's Day flower arrangements, bouquets or gifts. This day is celebrated to honor Anna Jarvis, a well known social activist in the United States. What flowers to gift mom on Mother's day? The perfect Mother's Day flowers and gifts you've been looking for; is just a click away. Handpicked Unique Gift Ideas for Mom. Fresh Roses, Lilies, Carnation & Gift Hampers specially crafted for your mum. Order NOW for guaranteed delivery on Mother’s day in Canada.